We’d love your help. Let us know what’s wrong with this preview of Surviving ELE by Rebecca Gober. To ask other readers questions about Surviving ELE, please sign up. Surviving ELE is the fourth installment in the dystopian style young adult series that follows Willow Mosby, a 16 year old girl having to cope with unimaginable circumstances that are developing around her at the same time as her remarkable powers are evolving. Surviving ELE continues from where we were left during the epilogue in Finding ELE with a story that yet again I read start to finish without a pause. The choices that Willow has to face are almost unbearable to read and the roller coaster Surviving ELE is the fourth installment in the dystopian style young adult series that follows Willow Mosby, a 16 year old girl having to cope with unimaginable circumstances that are developing around her at the same time as her remarkable powers are evolving. Surviving ELE continues from where we were left during the epilogue in Finding ELE with a story that yet again I read start to finish without a pause. The choices that Willow has to face are almost unbearable to read and the roller coaster ride of emotions that I have come to expect from these books was more at the forefront than ever. Just when I think I have figured out what is going to happen another curve ball is thrown in the way keeping you page turning until the very end. At one point I thought they were actually wrapping the series up and to be honest I wasn't sure if I was relieved that Willow might finally be catching a well deserved break or upset that there wouldn't be a fifth book to look forward to. Well I needn't have worried because just like with the previous three I am now sitting here with more unanswered questions! Whilst dystopian style stories are nothing new, these books continue to have a fresh take on things but then they throw in something like the "white eye" power which reminds me of historical stories of seers (and no that isn't a spoiler ... white is not the power of prophecy). Eeeep! This book was fantastic! So many things happen, so many issues are resolved. Questions were answered. All around wonderful and fun! I will not go into too much detail with this book because I want you to read it - I'm not CliffsNotes! There is quite a few places that caused my heart to beat out of my chest. There was a few scenes that seriously made my belly tingle. There was one scene in particular that had me screaming at the book - cheering Willow on and saying FINALLY!!!!! And for my on Eeeep! This book was fantastic! So many things happen, so many issues are resolved. Questions were answered. All around wonderful and fun! I will not go into too much detail with this book because I want you to read it - I'm not CliffsNotes! Fourth book in the series & they just keep getting better & better!!! Willow's back & Zac has taken Toni from her! She must face him, but she's not on her own, her friends refuse to let her go it alone. Willow must get Toni back & then just when you think all is well, she must save her friends & family. This book is thrilling, action packed, funny in places & in other places had me in tears. But such an exciting rea I was given this book by the author for an honest review. Surviving ELE spurred my insomnia. I’ve been waiting for this book for what felt like forever. I’ve been so anxious to find out what would become of Tony. This was another great installment in the series and I am very curious to see where they take the series from here. The ending made it more than clear that this is not the end of Willow and her friends. There were a few formatting issue in my copy, but they weren’t even distracting enough to catch my eye most the time. I only mention it because Surviving ELE spurred my insomnia. I’ve been waiting for this book for what felt like forever. I’ve been so anxious to find out what would become of Tony. This was another great installment in the series and I am very curious to see where they take the series from here. The ending made it more than clear that this is not the end of Willow and her friends. There were a few formatting issue in my copy, but they weren’t even distracting enough to catch my eye most the time. I only mention it because I’m sure others will rate according to this minor issue. However my review will be purely on the story. I’m tired of reading reviews that don’t so much rate the book but the grammar, formatting and spelling issues. They addressed a major nagging question in my mind-why did they not return to the shelter after everyone cleared out and see what was happening with this—in my mind—perfect place to loot. I was sure there would be some good stuff there lol. I was happy to see that through all this drama and unfairness in Willow’s life she showed moments of simply being a sixteen year old girl i.e. the Willow/Alec relationship. Now Spoiler alert I smiled when Zack finally got what he deserved, in a purely evil and fantastic way! This whole series has been fantastic, once I picked up PROJECT ELE I was hooked and I’m still in Rebecca and Courtney’s snare, I can’t wait to get my hands on the next book. At the end of book 3, Exposing ELE, Willow was running in fear from someone she thought she knew, someone she trusted with her life. At the start of book 4 she is still running, not only from one, but two people. One of them is Zack, who has taken over from his father in trying to gain more insight into why Willow has the powers she has, and is trying to have those powers for himself. In this book Willow has to deal with a lot of emotions - loss, fear, and anger among them. She is captured on more At the end of book 3, Exposing ELE, Willow was running in fear from someone she thought she knew, someone she trusted with her life. In this book Willow has to deal with a lot of emotions - loss, fear, and anger among them. She is captured on more than one occasion by Zack. Can she escape his clutches every time or is she destined to become his lab rat after all? Willow also acquires new powers, due to her ability to reap someone else's powers. However she has never gone as far as the reapers themselves as she still has control of her humanity. She has to rein in her anger at times as she feels herself start to go out of control. Does this mean she will eventually turn into a reaper as she has feared for some time? Or is there something different in Willow that the reapers are lacking? This book allows the reader to see the depth of the love Willow's friends have for her. They would go to the ends of the earth for her, and during this book she realises that she is not alone, she does have her friends behind her. And these friends are most definitely needed now. The ending is such a lovely ending. After everything she has been through it's nice to see Willow finally getting a little bit of happiness. But obviously this won't last for long. I have so much respect for the authors of this series. They have written all of them consistently well, with enough action and teenage angst to appeal to all ages. Roll on number 5! Surviving ELE is the fourth book in the ELE Series which centres around 16 year old Willow Mosby. Since we first met Willow in Project ELE she has grown so much more than she thought she would. At every turn she has faced new hardships, heart ache and despair. But she doesn't let that keep her down for long. When we left her in Finding ELE she was running for her life, from the man she was falling in love with, a man who was being controlled by Zack. True to form Willow fights back and refuses t Surviving ELE is the fourth book in the ELE Series which centres around 16 year old Willow Mosby. Since we first met Willow in Project ELE she has grown so much more than she thought she would. At every turn she has faced new hardships, heart ache and despair. But she doesn't let that keep her down for long. When we left her in Finding ELE she was running for her life, from the man she was falling in love with, a man who was being controlled by Zack. True to form Willow fights back and refuses to give up on the man she loves and vows to get him back. Gober and Nuckles have once again delivered in the series that never fails to amaze me. Just when you think you know where the story is going they blind side you with something completely different. At one point whilst reading I had this awful thought that this would be the last book in the series and it certainly looked that way for a bit, but I am pleased to report there will be more to come. The excitement you feel reading this book may lead to a heart attack (no not literally). Eeeep! This book was fantastic! So many things happen, so many issues are resolved. Questions were answered. All around wonderful and fun! There are quite a few places that caused my heart to beat out of my chest. There were a few scenes that seriously made my belly tingle. Reading this whole book I wanted to kick Zack he is such an…… well you get what I am trying to say right? Another great book from two of my favorite authors. Keep up the great work. After 4 books in 72 hours, I still want more! I've read the first 4 books in the past 72 hours (on top of working full time) and I cannot get enough! The story doesn't seem to be dragging on or filled with fluff to take up pages. It keeps you captivated. I absolutely love this series, the characters and all of the attention to detail. My only recommendation would be more editing, because the grammar, punctuation, and spelling all need to be cleaned up a bit. Good storyline, but had a lot of glaring typos. Needs to be edited better. I'm really torn on this book. I'm not great at writing reviews, but I know what I like and what I don't. In this case, unlike the first 3 of this series, I am struggling with a positive review. I normally refrain from giving a review if my review is not positive but in this case it is my hope that my review will allow the authors to make improvements before releasing the next book. I hope the authors will forgive me for the following somewhat harsh review, but I feel it should be said. Edit: I h I'm really torn on this book. I'm not great at writing reviews, but I know what I like and what I don't. In this case, unlike the first 3 of this series, I am struggling with a positive review. I normally refrain from giving a review if my review is not positive but in this case it is my hope that my review will allow the authors to make improvements before releasing the next book. I hope the authors will forgive me for the following somewhat harsh review, but I feel it should be said. Edit: I have added one more star because the formatting error has been fixed. The rest of my review still stands. I would prefer to give this book 3.5 stars, but since 3 is too low with the formatting fixed I gave a 4. What really ruined everything for me was the writing itself. I remember the writing style from the first 3 being a little simplistic, but this one seemed downright childish. I get that as a YA title this is intended for a younger audience, but even my 11 year old noticed the very plain almost child-like writing style in this book. I read this while my daughter was coming out of anesthesia in the hospital (just this past Monday) and SHE read some while not only still recovering from anesthesia, but loopy on painkillers and she still had zero trouble comprehending what she was reading and commenting on how simple it seemed for "something you would read mom." At times, especially during dialog it felt like I was reading a 5th grade essay rather than a young adult novel. The whole thing feels rushed. Written in a rush, edited in a rush, released in a rush. You know the feeling in Jr. High when you have a 1000 word essay due, but you only have 900 words so you pick through and add in extra words and flip things around to get exactly 1000 words? I feel like the authors/editors of this book did the exact opposite. At times I felt like words were removed and things condensed down for some reason I cannot quite fathom. I found myself wondering if releasing a kindle edition book on kindle is priced by the number of words and a lot of words were removed to keep publishing costs low. I felt like this book could have easily been longer and contained more detail and not felt so rushed and cut short. It felt like every sentence was cut short, like a kid reducing how much he has to write. I felt like the descriptions given in most of the book were inadequate making it difficult to paint a picture in my head for many of the scenes. I'm pretty sure that this series just keeps getting better! Just when you think the plot line can't change, and become even more original, it does, taking you on the winding path. The one major thing (if you are going to categorise this as dystopian - which you can, though I am putting it under Sci-fi on my own Review list because of the powers granted) is that there isn't too much death, there is a bit (particularly looking at the major death in the previous book there) but it isn't overwhelming as in some books (i.e. books like The Hunger Games where about 90% of the characters die). It doesn't seem unrealistic that not many people have died though. Turns out my prediction about there being 12 powers isn't too far off! Well there are more than 12 but my idea that they came from the immunisations did turn out to be correct. The romance in this book has changed slightly from the previous ones. There is no longer any overwhelming rivalry between Alec and Tony, and it was honestly refreshing to see all three sides of a love triangle actually get along! Though, even saying that, the majority of the love story in Surviving ELE was actually to do with Willow realising how she felt about Tony. Wow! just Wow! I am speechless! and exhausted! the running in this book was crazy...lol...I absorbed every word and I don't think it could have been any better! this story is freaking amazing! We start again where the last left off Willow is trying to find a way to fixing Zack's hold over Tony but the visions are getting stronger and she knows it is only a matter of time before Zack takes him over completely. When Tony becomes to much of a threat to the groups safety Willow takes him away for a fe Wow! just Wow! I am speechless! and exhausted! the running in this book was crazy...lol...I absorbed every word and I don't think it could have been any better! this story is freaking amazing! When Tony becomes to much of a threat to the groups safety Willow takes him away for a few days before the change can take its full affect. It doesn't take long for the visions to catch up though and Willows life is in danger from the man that she loves most in this world and she decided that she is going to go after the man responsible for her pain, Zack. Her plans go ary however and she ends up captured and Zack has some very sinister plans in mind. Willow manages to escape temporally but Zack captures her friends and family to lure her back. What will she do? There is only one thing left to do, go in and take out Zack once and for all and this time she is going to finish the job, or die trying. Unfreakingbeliveable! best story EVER! I so can't wait for the next one! I wish it was out right now so I could read it! hurry up and write Rebecca and Courtney!! !....lol...I devoured every word just like the rest and I can't believe the ending!!! I so have to know what is going to happen! I love all the new powers popping up and I hope their are some more in the story to come! my favourite part in the book was when Tony and willow used the reading power on each other! I soooo love those two! Zack is the ultimate bad guy! He is way more creepy then his father! He always goes to the extreme and has way more creative ideas of torture and chaos then his father ever did! It's been a few months since I've read the ELE series. Surviving ELE, I picked up because I wanted to read another great Dystopian Romance. I loved the initial premise of Project ELE and I really enjoyed the first three stories in the series. Surviving ELE is the fourth book in the ELE series. It took me awhile to get into the novel. I felt as though a lot of the story was told to me, not shown until the last quarter of the book. The authors work good together when it comes to action and suspens It's been a few months since I've read the ELE series. Surviving ELE, I picked up because I wanted to read another great Dystopian Romance. I loved the initial premise of Project ELE and I really enjoyed the first three stories in the series. Surviving ELE is the fourth book in the ELE series. It took me awhile to get into the novel. I felt as though a lot of the story was told to me, not shown until the last quarter of the book. The authors work good together when it comes to action and suspense. When there are twists and turns in the series (and there are two big ones thrown at you near the middle and again end of the story), the book really moves along. I felt like Surviving ELE suffered in the first half of the book. It was well edited and clear but the writing didn't pull me in. The story felt slow until half-way through the book when suddenly it picked up speed like a freight train. After 4 books and around 600 some pages, I don’t have much to say. It’s much the same as previous installments but the love triangle is resolved, which leads to its own set of trouble. We’re finally getting into the government side of things, which is what I’ve been dying for. Surviving ELE feels more like filler or an appetizer than a satisfying novel that can stand on its own. It does finish the save Tony storyline but it doesn’t feel like enough. Maybe because I was jumpy throughout to get somewhere with the larger plot that I get a sampling of but didn’t sate my appetite. Way to not edit!! So there was continuity issues and spacing issues incorrect usage of words. "There is rage in his tone as he insinuates the verbs." Insinuates? That word.. I don't think it means what you think it means...I had trust issues reading anything from a new author so quick to fame and now I rememebr why. Did fame and money go to your head so you pushed the release and didn't care about the process anymore? The last one was release in December. books are not supposed to be made within Way to not edit!! So there was continuity issues and spacing issues incorrect usage of words. "There is rage in his tone as he insinuates the verbs." Insinuates? That word.. I don't think it means what you think it means...I had trust issues reading anything from a new author so quick to fame and now I rememebr why. Did fame and money go to your head so you pushed the release and didn't care about the process anymore? The last one was release in December. books are not supposed to be made within two months. You're not Dean Koontz. The plot was.. ok. The ending sucked. Did NOT leave me interested in the next one. Besides how put off I was but the editing issues the ending gave me just enough closure to not care what happens next. I am disappointed. AND I saw some reviews where people said they got the book early for an "honest" review.. that sounds a bit back alley to me. "Here take this.. just make us look good". I did not get the book early. I was on the edge of my seat the whole time they were going through their missions and doing recon. When Zack would appear in the book I got angry and could totally feel what Willow was feeling, when Zack was controlling Tony I was so emotionally torn for him and Willow. I just wanted to reach into the book and take it away from him, make Zack STOP! I have connected so much with the characters in this book, I am suffering a big book hangover with this whole series right now. I read the fir LOVED IT! I read the first two awhile back, but re-read them so I could read books three and four. I read these all in a matter of days and the high I got from these books and all the feelings the characters make me feel is amazing. These 2 ladies know how to write a book and they have made this series amazing so far!!! I thought I was done with the Series when I was almost done with book 4, but then I get to the end and it says TO BE CONTINUED and I said whaaaaaattttttttttt!!!!! So I am now anxiously awaiting news on the 5th book and when it will be out!! This is the fourth book in the ELE Series, and once again, the authors do not disappoint. The war between Willow and her friends and Zack and his minions has reached epic proportions, and they'll stop at nothing to take each other down. Willow's fighting for her family, her friends, her love, and her life, as Zack wants to sell her blood and powers to the highest bidder, while also keeping some for himself. He has to be stopped, a Disclaimer: I received an e-copy in exchange for an honest review. This is the fourth book in the ELE Series, and once again, the authors do not disappoint. The war between Willow and her friends and Zack and his minions has reached epic proportions, and they'll stop at nothing to take each other down. 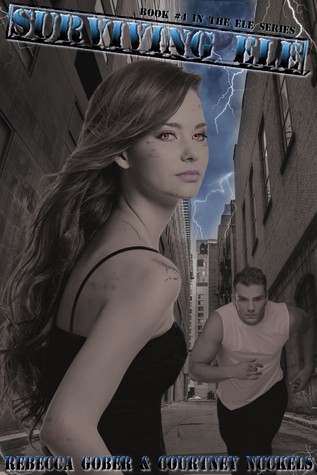 Willow's fighting for her family, her friends, her love, and her life, as Zack wants to sell her blood and powers to the highest bidder, while also keeping some for himself. He has to be stopped, and fast! "Surviving ELE" is a wonderful continuation of Willow's story, as we see further into Zack's evil plot and Willow's relationships with her family, friends, and especially Tony. He's under Zack's control, and she knows she has to stay away from him, but how can she when he's the love of her life? I can't wait for what happens next, this is such an awesome series! Disclaimer: I received this book in return for an honest review. This book picks up where Exposing ELE leaves off and does not disappoint. From start to finish I was so pulled into this story that I was unable to put it down. This series has by far become one of my favorites and the author's of this series are truly talented. I have come to love the characters and find myself rooting for them along the way. I can't wait for the final book in the series "Ending ELE" to see how this series ends. This series is one of my ultimate favorites, I have 're- read this series many, many times and each time not only do I feel like it's the first time but there is so many feels with this series. Author Rebecca Gober, will rip your heart to shreds and then puts it back together piece by piece, until your completely whole with faint remembrance of the pain you went through along with each of our beloved character's. I would definitely recommend this series. As me move forward lines will be tested choices will be made and wars will be started. Who will come out on top? Another interesting installment in the series...we find a little bit more out about the background of the characters, and the story progresses a little. No major faults with it, I'm just hoping to finally get all the answers in the last book because although this book answers a few, it gives you a few more questions to ponder.